The service area allows you to control the management and resolution of customer support cases as they arrive within CRM. 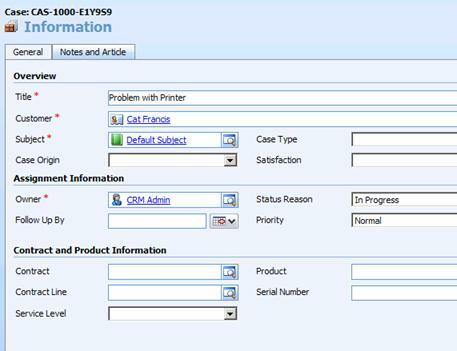 Service queues can be set up easily to receive incoming emails and activities can be converted to a case against a queue. Customer Service staff can then browse the queue and accept cases working towards their resolution. The case can be put back in the queue or assigned to second or third line support if it cannot be resolved. · Cases defined for each customer service incident. · Contracts which may be created against a customer if service contracts are relevant to the organisation and cases tracked against support contracts. · Knowledgebase Articles which allow a rudimentary automated help desk facility where a bank of articles can easily be searched and emailed to resolve a case. · A subject hierarchy for organising the knowledge base and cases. · Service Activities which require the allocation of at least one resource to an activity (see the next section). · Activities can be created for a case and must all be completed before the case is resolved. A Case is defined to cope with a customer service enquiry. A case is defined against a customer and must have a title, an owner and a subject and must be linked to a customer. The Notes and Article tab is a convenient place to store progress notes against a case but also allows a full text search of the knowledge base. If an appropriate knowledge base article is found, it can be stored against the case and easily emailed to the customer. 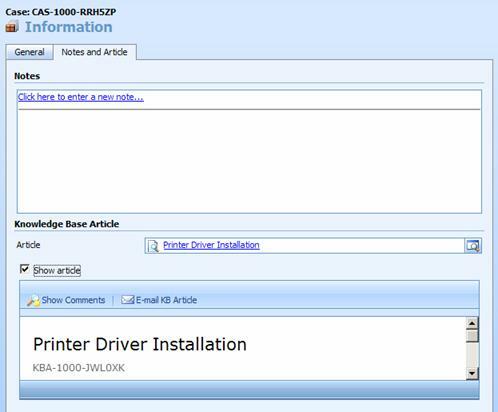 Note: You can email the knowledge base article directly to the customer if you click the show article checkbox on the case form and press the Email KB Article button. Cases can be created from the account or contact form and should be attached to a contract if you need to track work done against a customer to match the time spent against the contract limits. A case can also be created by converting an activity to a case from an incoming email for example. Some installations have an incoming email address (for example support@redware.com) that brings emails into a queue for the customer service team to view and promote to cases as required. Queues are an integral part of working with the service functionality of CRM and newly promoted activities or incoming emails from a customer support email or helpdesk activities are often assigned to a queue where the customer service person dealing with the request is not known when the case is created. Members of the customer service team can browse unresolved cases and take ownership to proceed to a resolution. The case can be reassigned back to the queue if the issue cannot be resolved and the case completed. Incoming cases may be assigned to customer service personnel initially by the first line support team or automatically using workflow. Each customer service representative can view their personal queues in the workplace-my work area which shows all newly assigned cases. Newly assigned cases appear in the assigned personal queue and move over to the in progress queue as each case is accepted (see the workplace section on queues). Although anyone can view and add activities, only the case owner can resolve or reactivate a case from the action menu, and cases can only be resolved if all activities held against it have been completed. Contract Templates must be set up to provide similar terms and conditions for different service contracts. They can be defined in the settings-templates-contract templates work area and determine whether time or number of cases apply as a constraint on the contract and also set out the available working hours. Service Contracts are defined against a customer, showing the dates for which service activity is covered. The contract name and customer together with the start date and end date of the contract must be specified, along with the billing address and currency. At least one contract line item must be added to the Contract before it can be invoiced. The total number of cases or the time allowed for all related activities can be defined on the contact line item and monitored by viewing the allotments used and allotments remaining fields on the contract line item form. The contract line item must have a title and a start and end dates and a constraint on the total time or number of cases allocated as well as a price. 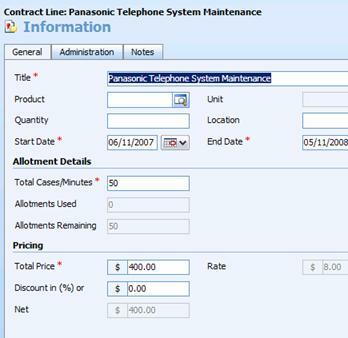 Contract line items usually refer to an item of equipment related to a product record. 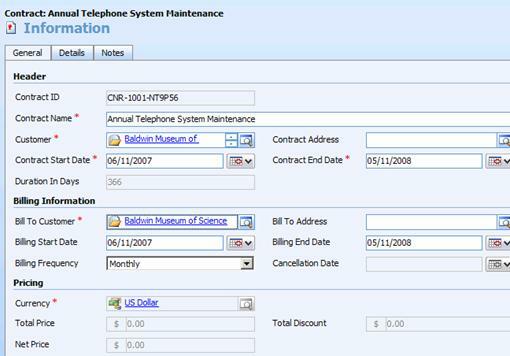 A contract is not activated to be used until the invoice Contract action has been selected. This does not create an invoice record but makes the contract record read-only and allows the contract to be referenced with a case. The contract cannot be activated until at least one contract line item has been added. Contracts can be put on hold (and released) and renewed if their expiry date is reached. Individual contract line items can be cancelled. Renewing a contract will create a new contract with the same details as the original. Note: Making the contract read-only after it is invoiced makes it difficult to add further contract line items to the contract while it is in progress and can cause some usability issues. 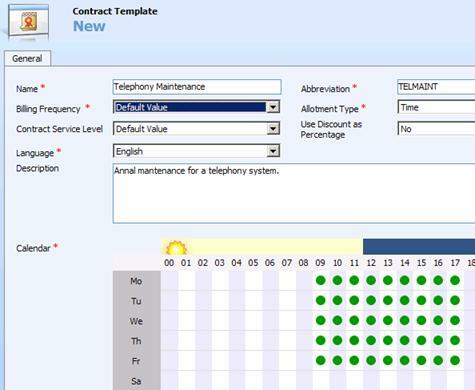 The total time and resources available for each contract can be used to check service activity against each contract as shown in the service management reports. The knowledge base allows resolutions to common customer service issues to be documented, and one method of resolving a case is to search the knowledge base area and link to the knowledge base article (which can also be emailed easily to the customer). 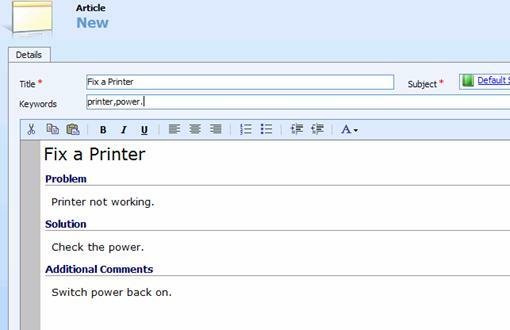 Users can add comments to articles to improve the knowledge base and articles can be associated with a case in the Notes and Article tab (or using the form assistant) and added to any email by pressing the Insert KB Article form button on the Email form. Each article is assigned to a subject which is part of a hierarchy to help organise articles (and cases and products) and can be set up in the settings area. An article template is required for each article (settings-templates-article templates), and users can create articles if they have the appropriate security settings. Once an article has been completed, the submit action is required to submit the article for approval. Once approved (probably by a manager), the articles can be searched for easily by any user and inserted into emails in addition to being used to resolve a case. Note: The knowledge base index is updated every 15 minutes and so changes are not made available immediately.